The Minister for Skills, Research and Innovation, Mr Damien English TD, was in Waterford Institute of Technology (WIT) today to officially open a ‘Metal 3D Printing – Additive Manufacturing Laboratory’ with the potential to revolutionise manufacturing in Ireland. The €1 million lab, which houses Ireland’s first production scale EOS 3D metal printer and post-processing accessories, is located in the South Eastern Applied Materials (SEAM) research group, one of the Institute’s three Technology Gateways. Speaking at the opening, Minister English said that "this initiative, which has the potential to revolutionise manufacturing industries in Ireland and represents an important development for Irish engineering and manufacturing, will offer many benefits to companies in the South East and beyond". The Minister, congratulating Dr Ramesh Raghavendra who will lead the programme from its base at the Enterprise Ireland funded Technology Gateway SEAM, noted that "the new laboratory will bring together industry in the form of Boston Scientific, Schivo and Lisnabrin Engineering in a unique and innovative collaboration with academia to provide strategic research expertise to companies interested in this new and exciting manufacturing technology". Metal 3D Printing Additive Manufacturing is an emerging technology which offers many advantages over conventional manufacturing methods including the advancement of metal laser sintering technologies to develop more complex components, streamlining the manufacturing process by removing multiple process steps, reducing materials handling and the number of components in an assembly, as well as enabling rapid prototyping of functional metal components. 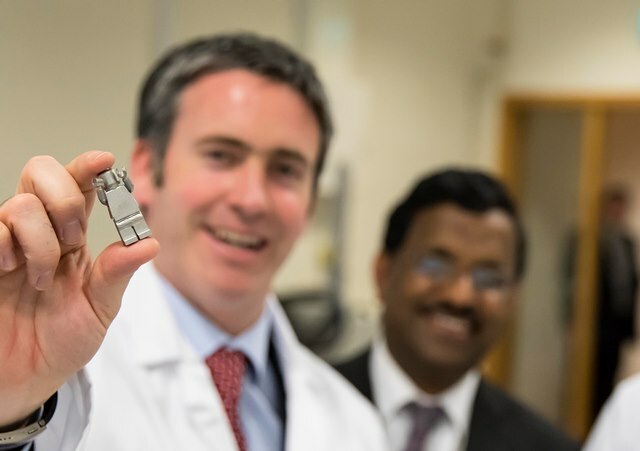 According to Prof Willie Donnelly, President at WIT, “The 3D Printing lab and its future research outputs offer enormous potential to engineering and manufacturing industries in Ireland. This technology is forecast to transform the factories of the future. Dr Ramesh Raghavendra, SEAM Centre Director said, “SEAM’s impeccable track record of collaborating with and delivering solutions to industries of all sizes across a variety of sectors, lays a strong foundation for our research centre to become a hub for Irish industry in the emerging Metal 3D Additive Manufacturing technology, which will deliver new and innovative design and component solutions for Irish industry”. SEAM has already started their research activities using the new technology. Late last year, the centre announced a Metal 3D Printing research programme in collaboration with Boston Scientific, Schivo and Lisnabrin Engineering. The multiparty, industry led project, which is part funded by Enterprise Ireland under its Innovation Partnership Programme (IPP), will run for two and a half year with engineering staff from the three companies working alongside researchers from SEAM.